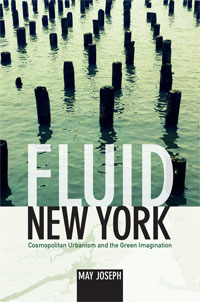 Fluid New York: Cosmopolitan Urbanism and the Green Imagination by May Joseph. Duke University Press, 2013. Hurricane Sandy was a fierce demonstration of the ecological vulnerability of New York, a city of islands. Yet the storm also revealed the resilience of a metropolis that has started during the past decade to reckon with its aqueous topography. In Fluid New York, May Joseph describes the many ways that New York, and New Yorkers, have begun to incorporate the city’s archipelago ecology into plans for a livable and sustainable future. For instance, by cleaning its tidal marshes, the municipality has turned a previously dilapidated waterfront into a space for public leisure and rejuvenation. Joseph considers New York’s relation to the water that surrounds and defines it. Her reflections reach back to the city’s heyday as a world-class port—a past embodied in a Dutch East India Company cannon recently unearthed from the rubble at the World Trade Center site—and they encompass the devastation caused by Hurricane Sandy in 2012. They suggest that New York’s future lies in the reclamation of its great water resources—for artistic creativity, civic engagement, and ecological sustainability.